Big Breams. Bad Slapshop. Back around 2000, I had a friend in Idaho who was sending me all kinds of great Idaho Steelheads (WCHL) stuff. 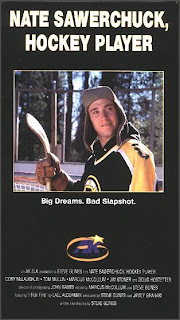 In one of his packages, I received a VHS tape with a movie called "Nate Sawerchuck, Hockey Player". It is a 23 minute mockumentary made by writer/director Steve Glines, who was a referee in the WCHL at the time. Nate Sawerchuck (Cory Mclaughlin) may not have the skill for a professional hockey career, but don't argue that with the locals of Elk River, Wyoming. This small town hero has been in training since he was a little whipper snapper taking slapshots in the kitchen. Professional hockey scout Mic Rody (Jim Stoner) discovers this diamond in the rough while stranded in the small mountain town. After Nate is made an honorary 13th round selection in the 1997 draft, Elk River erupts with support for its young star. With direction from his father/agent (Tom Mullin). Nate willingly takes on the role of a superstar. If you are a fan of minor league hockey and TV & films such as Corner Gas, Slap Shot and This is Spinal Tap, then you will get a kick out of this goofy little film. I have probably watched 10 or more times over the past 8 years and, the more times I watch it, the funnier it becomes. The dry humor is not the sort of thing that everyone will enjoy (or get), but it is so easy for me to watch this and believe it is a true story. You can check out the complete movie online at Spike.com.